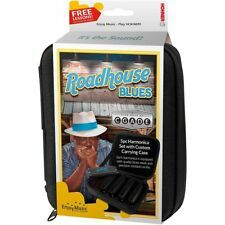 Fender Blues DeVille Harmonica Key of G, New! It really stinks when you have to sit out every other song because you don't have all of the right keys. All common keys. If you’re not satisfied, neither are we. It’s that simple. Two (2) Vintage Hohner German Echo Harp Lot. Condition is Used. Shipped with USPS First Class Package. An octave harmonica is a necessity to anybody serious about their harmonicas, and Hohner knows how to do it! Casual players will also appreciate the fact that it has a reasonable price. This harp is not for lightweights! 3 Hoodoo Blues diatonic harmonicas. New Gear: If you’re not satisfied, neither are we. It’s that simple. Zippered, Tolex carrying bag. No international accounts. Check-Out Now! He had it during the war. Plastic combs are more stable and do not swell, shrink, or crack. Another plus of the Hohner 560 Special 20 harmonica's design is that its smooth mouthpiece features reed plates that are recessed into the comb. Item: T008K- 12. 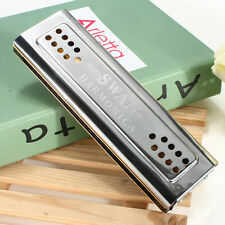 10holes blues harmonica with 12 keys brass reedplates with electroplating nickel. brass coverplates with black paint. 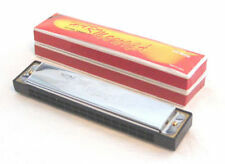 THIS IS A GREAT AND ONE OF HOHNER'S MOST POPULAR HARMONICAS. THIS IS A SPECIAL SALE PRICE ON THIS ITEM RIGHT NOW. THE SPECIAL 20 STYLE HAS A SPECIAL AIR TIGHT DESIGN THAT MAKES THIS HARP ONE OF THE PROFESSIONAL PLAYERS MOST COMMON CHOICE. KONGSHENG POWER BENDERS X 5 KEYS OF C,D,LF,G,A - SANITIZED. Condition is Used. Shipped with USPS Priority Mail. Blues is an incredibly versatile and eclectic genre. There’s different styles throughout the US, the UK has its own blues scene, and Irish folk has bluesy influences as well – or does blues have Irish influences?. 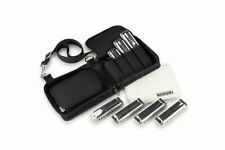 Suzuki Promaster MR-350 10 Hole diatonic harmonica; Key of G; includes plastic hard case. It really stinks when you have to sit out every other song because you don't have all of the right keys. All common keys. New Gear: If you’re not satisfied, neither are we. It’s that simple. No international accounts. The plastic comb is in great condition.The reed plates, the cover plates, the plastic comb had been detailed cleaned. All notes had been checked and make sure of correct strong and with beautiful sound. Hohner International Blues Band Harmonica. In excellent condition. Hohner Marine Band Harmonica Made in Germany Handmade No 1896 Key G gently used. Really good shape. The photos exaggerate how noticeable use is. Shipped with USPS First Class Package. Vintage Germany M. Hohner Marine Band Harmonica No.1896 Key of G With Box. Like new condition! Comes from a non smoking home with a cat. All models of the Echo Line are playable on one side and have an exciting nice and warm tremolo sound which is well established in the traditional folk music. These reeds – which are basically identical – are tuned to slightly different frequencies. This professional grade harmonica was made by Seydel for the folks at Fender and it was made as a superb quality professional harp to the highest standards. The finest in Fender comfort and style, it’s optimized for peerless performance with rounded cover plates and an ABS comb for enhanced playing speed with a longer lifespan after demanding performances. Hering's Chromatic Harmonica in key of G. Appears to be in good condition with no missing screws or parts. They belonged to my father who passed away. This is great condition, possibly never used. The wood is perfect with no loss of the red finish. Lot Of 6 Hohner Harmonicas, Key G. Condition is Used. 1 "Blues Harp", 3 "Marine Band", and 2 "Special 20 Marine Band". All in very good condition. One of them is missing a screw and has a tiny dent as shown. 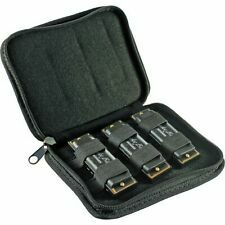 Harmonicas-Vintage Bushman Soul's Voice-Keys LC,C,LD,Eb,LE,LF,G,HA,Bb - Sanitized. Less than 1 hour use per harp. Used as back-ups. Condition is Used. Shipped with USPS Priority Mail. 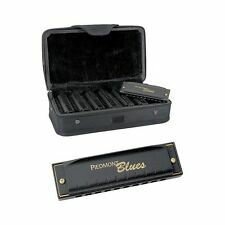 2-in-1 design distinguishes this tremolo harmonica from other harmonicas. Good choice for professional players. Style: Tremolo. 1 Harmonica. Comb material: Resin. Reed material: Copper. Plate material: Copper. Super Chromonica - The industry standard - The classic all-round chromatic harmonica, suitable for all styles. 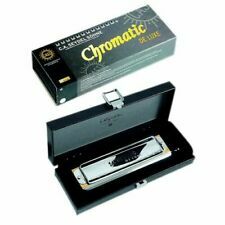 Choice of the world's leading Harmonica artists, the solo tuned Super Chromonica has a three-octave chromatic range beginning at middle C. Contains 48 reeds, fitted with special wind-saving valves. Trending at $47.00eBay determines this price through a machine learned model of the product's sale prices within the last 90 days. Hohner's diatonic harmonicas set the industry standard through their high quality construction, excellent response and unsurpassed tone. Richter tuning and undivided air channels allow for bending and overblowing the reeds, creating the signature wailing sound typical of the harmonica. Tuned to the keys of C, D and G, the HooDoo Blues Diatonic harmonicas feature, 10-holes, brass reeds and includes a zippered carrying bag made with tolex material to bring your HooDoo harmonicas to every jam. Hohner Marine Band Harmonica 1896BX in the Key of "G" + Bonus Hohner Mini Harp!